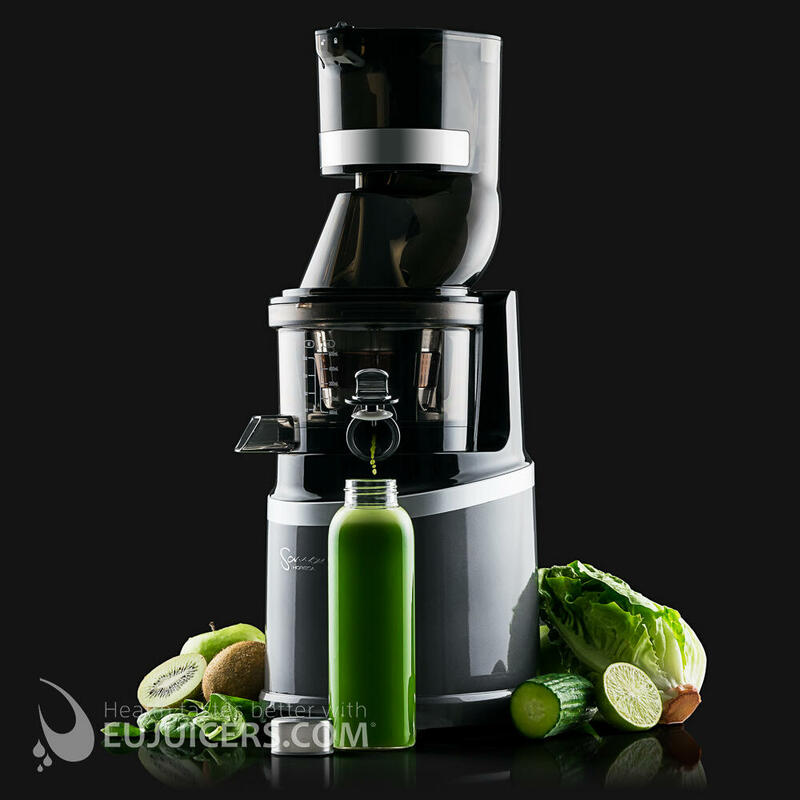 The Sana Horeca EUJ-909 is the first auger-driven commercial juicer. 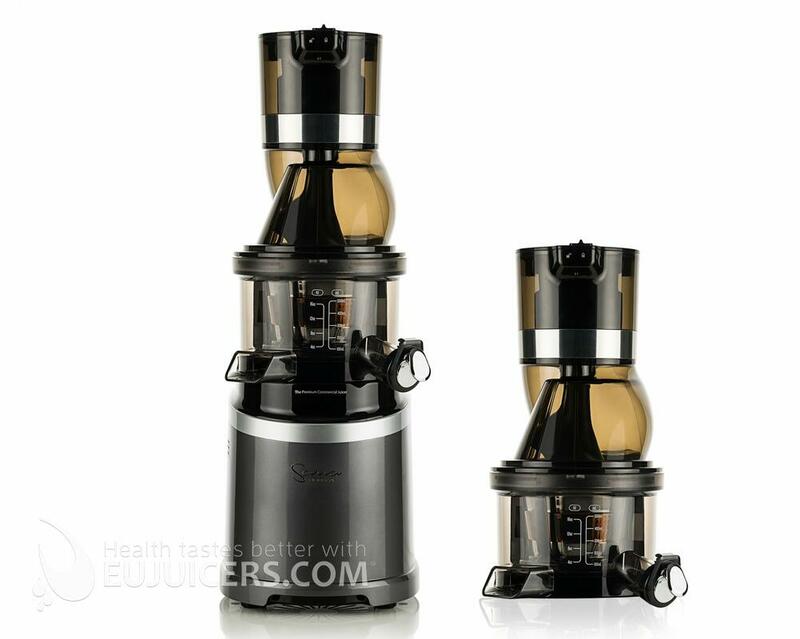 This type of juicer is unique in the commercial market, and has many advantages over the centrifugal juicers that are typically used in juice bars, restaurants, and fitness centers. 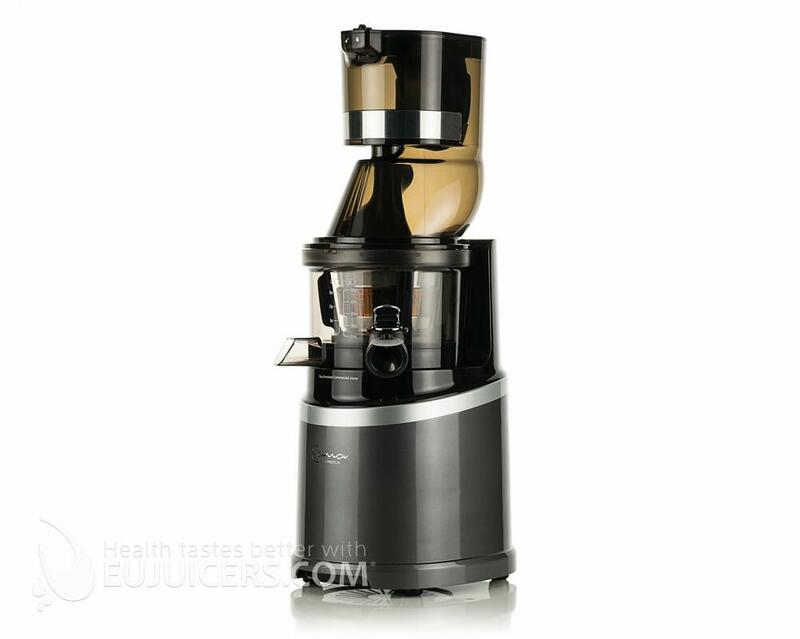 Unlike centrifugal juicers which can exceed 100 decibels, the 60-rpm operation of the Horeca juicer is very quiet. It’s the first thing you notice when you turn it on. Also, because auger-driven juicers extract much more juice from fruits and vegetables than centrifugal models, the Sana Horeca EUJ-909 can significantly save money by requiring less produce for the same amount of juice. Because it operates at a much lower rpm, the juice it produces is of much higher quality than that from a centrifugal juicer. There is far less pulp, the taste is sweeter, and the consistency is much smoother with almost no foam. And unlike commercial centrifugal models, the Sana Horeca effectively processes greens like spinach and swiss chard. Most importantly, the low speed operation practically eliminates oxidation, meaning juice can be stored up to 24 hours and maintain its flavor, look, and nutritional value. 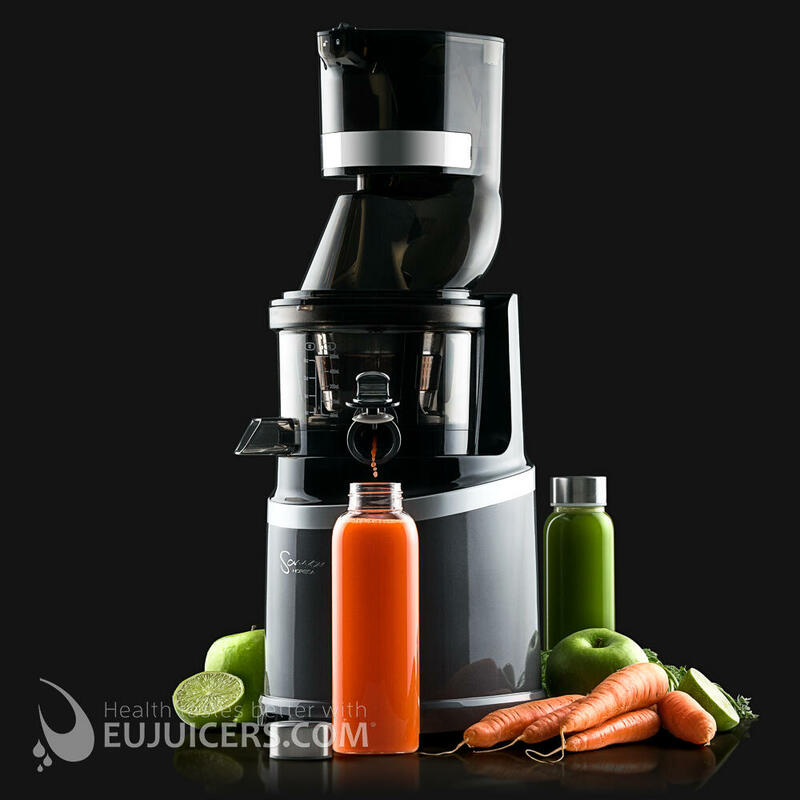 The Sana Horeca EUJ-909 is very versatile and can juice just about any fruit or vegetable. 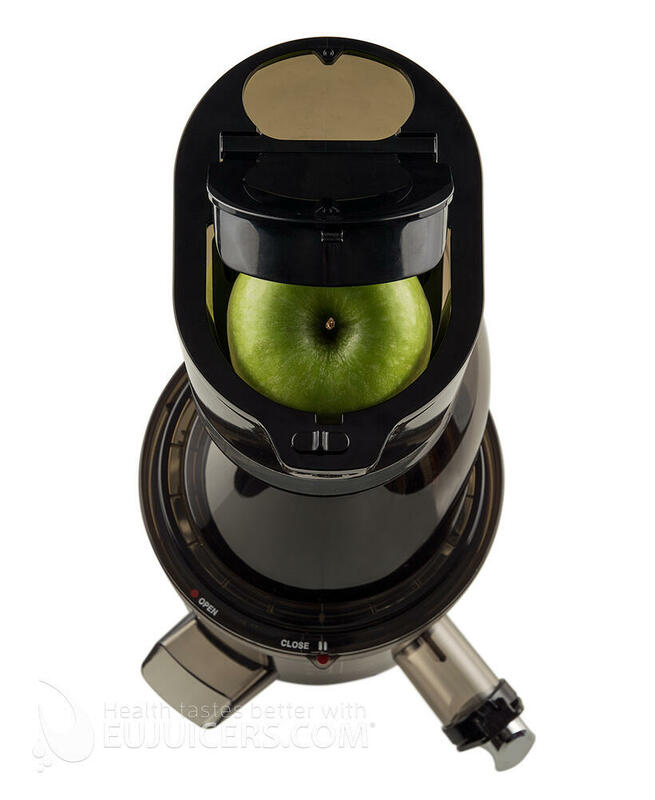 Apples, pears, citrus, berries, tropical fruits, root vegetables and leafy vegetables are all no problem for this juicer. As with any juicer, using the freshest produce will give the best results. 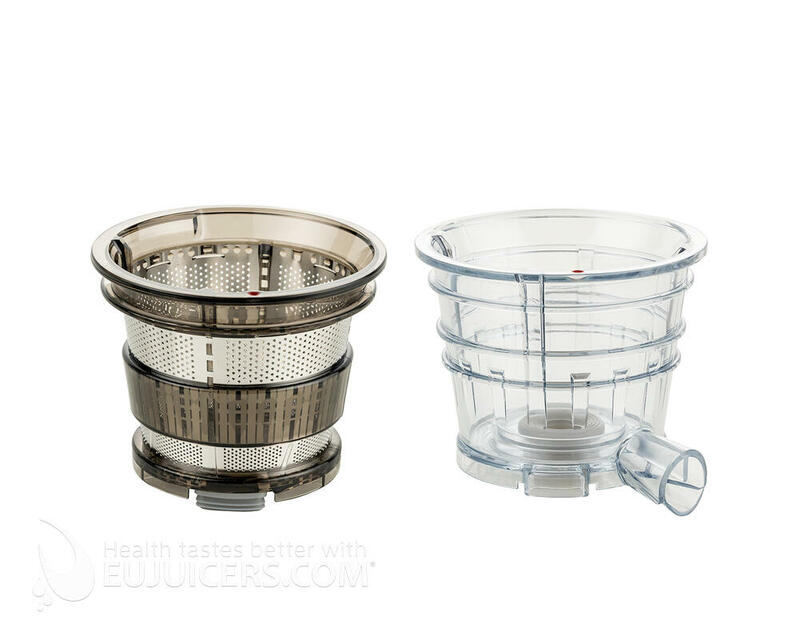 One unique feature of this juicer is the juice cap, which acts as a tap and can be closed during juicing. This allows you to mix different types of produce together in the juicer, or even add other ingredients such as milk, yogurt, or alcoholic beverages. 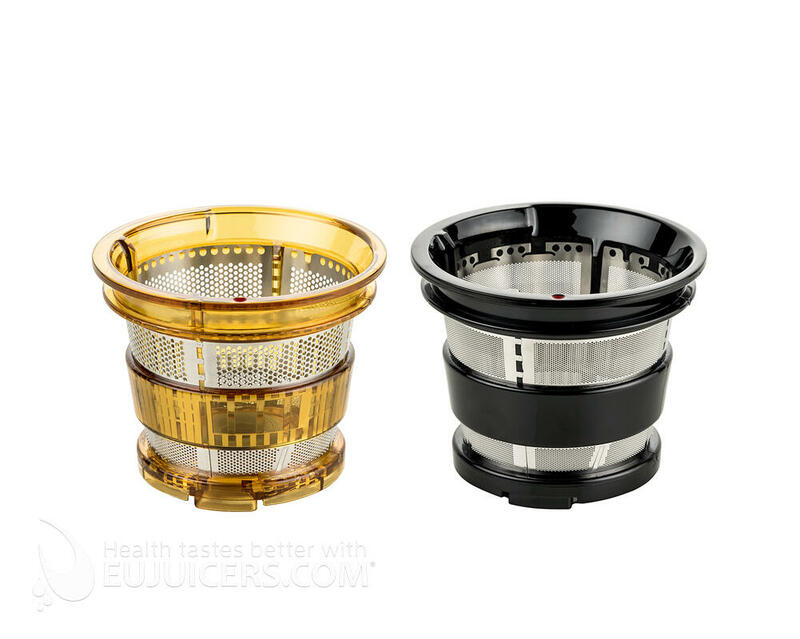 The juice cap has another benefit: between juicing different fruits (or mixing drinks), you can add water to the juicer and let it run for a few moments, and then open the cap to drain it. 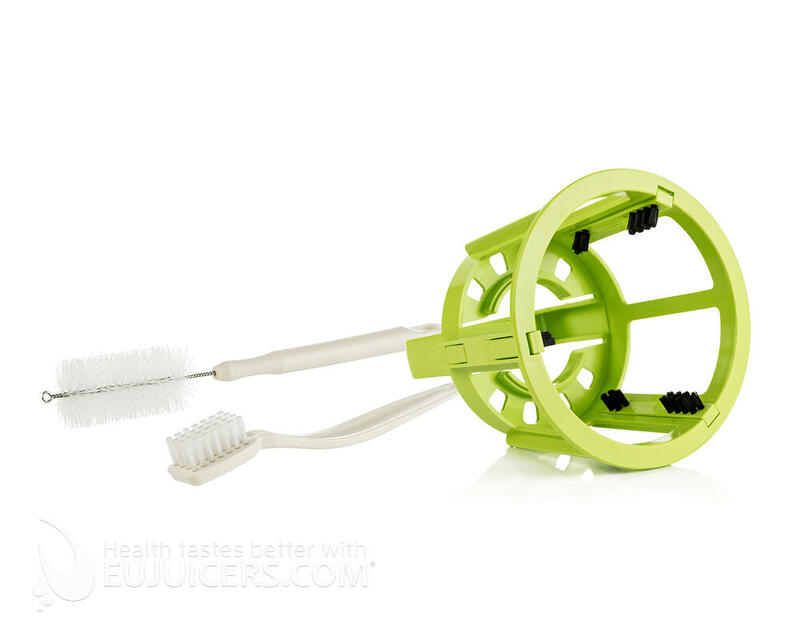 Because the 909 has rubber cleaning blades that continuously clean the strainer, this cleans out the juicer quickly and easily. A major requirement of juice bars and restaurants is to be able to make a lot of juice quickly. 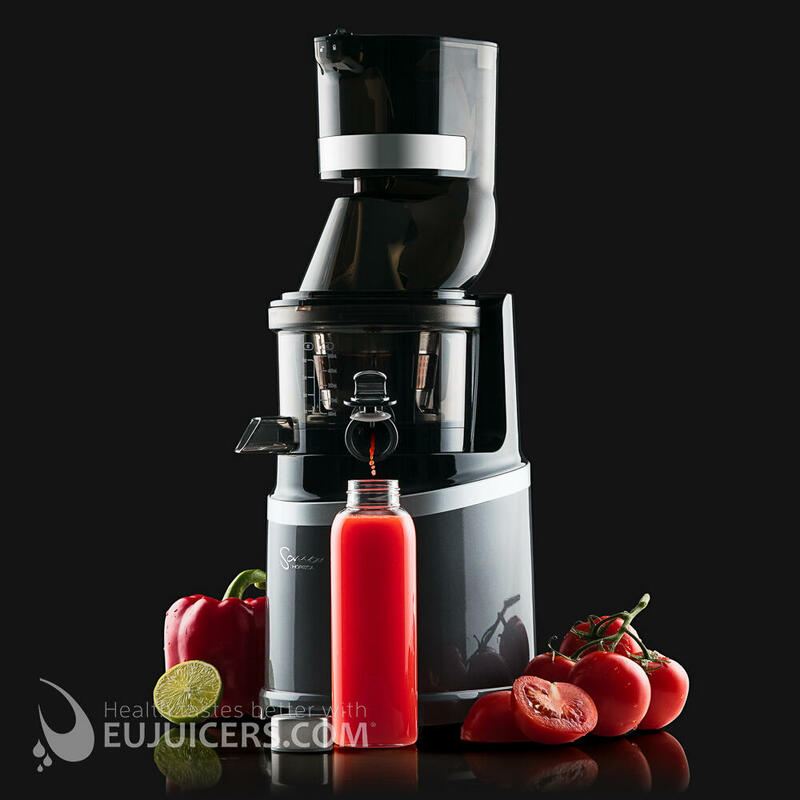 Despite operating at only 60 rpm, the EUJ-909 produces a good volume of juice in a short amount of time. Because it has an extra-large feeding tube (88 mm), cutting and preparing of produce is minimized. It can even take smaller varieties of apples whole without any preparation. In addition to being able to be quickly rinsed between juicing, when it needs to be cleaned the process is fast and simple. There are just a few parts that are easily removed from the unit and only need to be rinsed under running water. The only part that requires any cleaning is the juicing screen, which is quickly scrubbed under running water with the included cleaning brush. The Sana Horeca EUJ-909 ships with two complete juicing head assemblies. 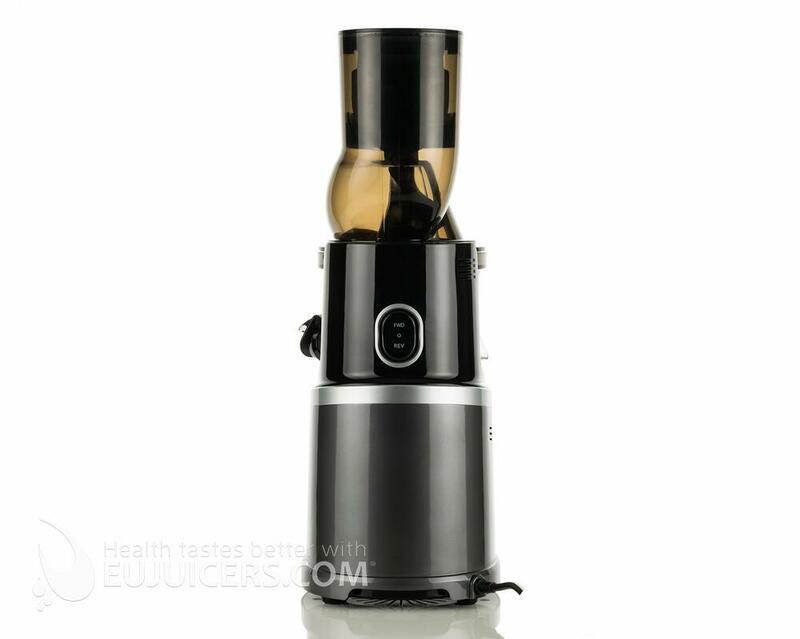 This allows you to switch between two different juices without any cleaning. For example, you can have one juicing head dedicated for citrus, and the second for a carrot/apple combination. 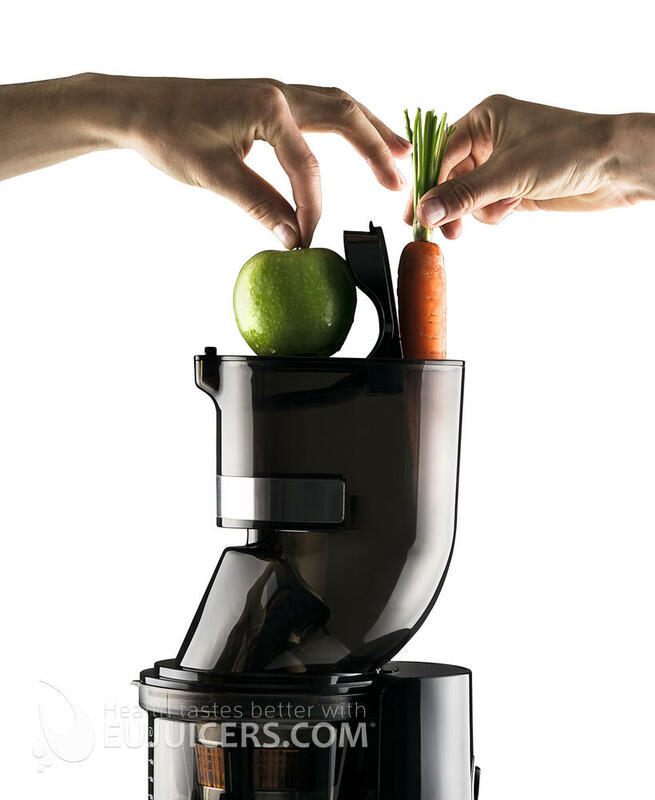 This really increases the versatility of this juicer. All the parts that come in contact with the juice are made from BPA-free materials. 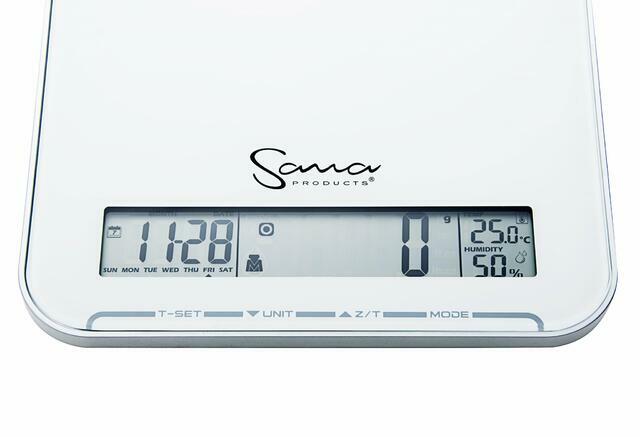 With three optional screens, you can do even more with the Sana Horeca. The homogenizing screen crushes ingredients together without extraction, which is perfect for things like fresh peanut butter, ice creams and sorbets, and sauces. The smoothie screen extracts juice but doesn't eject the pulp. It's great for making fruit smoothies, like a strawberry smoothie with almond milk. The coarse screen is similar to the included fine juicing screen, but has larger holes so it is helpful for softer or pulpier produce like pineapple or berries. The Sana Horeca EUJ-909 juicer is really something unique in the commercial juicer market, which until now has been dominated by centrifugal juicers. What stands out to us is the versatility of this machine, as it can handle a lot of things that centrifugal units cannot and can also make mixed juices. Another big plus is the clear difference in the quality of the juice produced, as well as the higher yield of juice. We also like the quiet operation, the fact that the motor can be run continuously for up 24 hours, and the ease of cleaning. 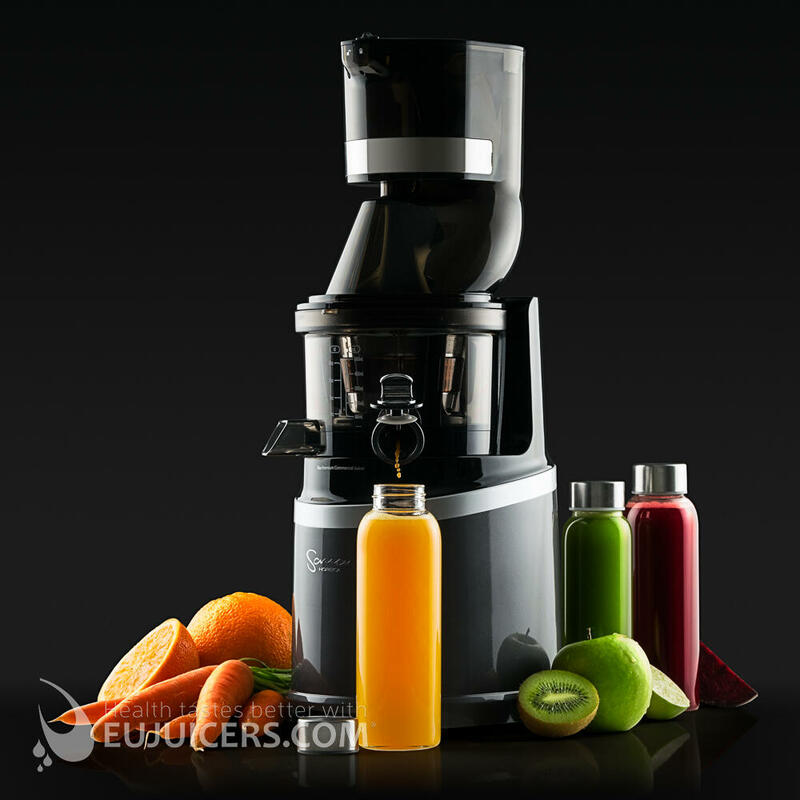 The inclusion of a second complete juicing head really increases the versatility of this juicer in commercial environments, allowing one to quickly and easily switch juice recipes without any cleaning. Also, while centrifugal juicers make foamy juice that must be consumed immediately, the EUJ-909 makes clear juice which can be stored up to 24 hours. 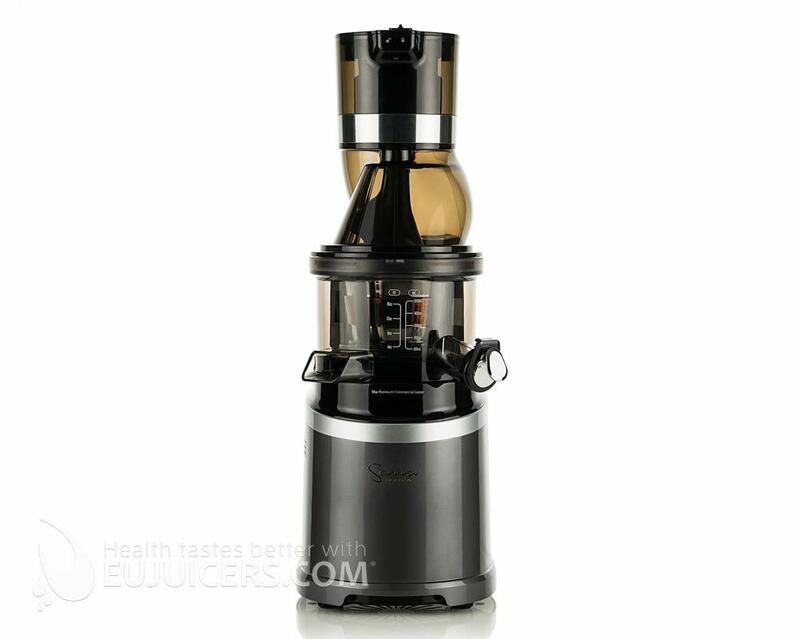 Overall, we think Sana's new commercial juicer is a game changer for high volume users like juice bars and restaurants that previously had to settle for loud machines making poor-quality juice. Free shipping to European countries.